Four Rockets Strike Hezbollah Strongholds In Lebanon : The Two-Way The strikes came hours after the leader of the militant group, Sheik Hassan Nasrallah, vowed to continue its fight to keep Syrian president Bashar Assad in power. It heightened fears that the sectarian violence central to the Syrian civil war could spread to Lebanon. 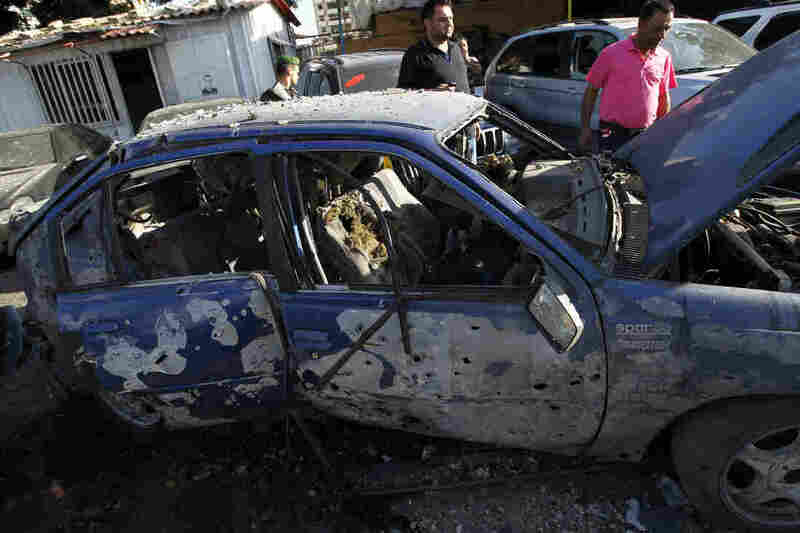 Lebanese men inspect destroyed cars after two rockets exploded in Shiah, a southern suburb of Beirut, on Sunday. Four rockets hit areas of Beirut, Lebanon that are controlled by Hezbollah on Sunday. The attacks came hours after the leader of the militant group, Sheik Hassan Nasrallah, vowed to continue its fight to keep Syrian president Bashar Assad in power. "There was no claim of responsibility for Sunday's attack. However, a Syrian rebel commander threatened earlier this week to strike against Hezbollah strongholds in retaliation for the militia's military support for Syrian President Bashar Assad. Hezbollah is a Shiite Muslim group, while most of the rebels are Sunnis. "Street fighting between rival Lebanese groups has been relatively common since the end of the country's 15-year civil war in 1990, but rocket or artillery attacks on Beirut neighborhoods are rare." CNN says that Lebanon's caretaker interior minister, Marwan Charbel, as saying the attacks on Sunday were "an act of sabotage to create tensions." "'God willing, the events in Syria will not spill over into Lebanon, and we hope that we will have more men with more reason because we just went over 40 years of civil war,' Marwan Charbel told NNA. "At the same time, he emphasized that he does not know who is to blame for the attack. "Like Syria, Lebanon's population is divided into religious and ethnic factions, some bitterly at odds with each other. "Hezbollah is one of the largest and best armed factions. It draws most of its foreign support from Shiite-dominated Iran and from the al-Assad government in Syria, which the U.S. accuses of acting as a conduit for Tehran's weapons deliveries." In related news, the Syrian government agreed "in principle" to take part in peace talks in Geneva next month. The CBC reports that Syrian Foreign Minister Walid al-Moallem said the Assad regime is ready to "send representatives to the U.N.-sponsored conference." It is still unclear whether the main opposition group — the Syrian National Coalition — will also sign on to the talks.